ZSL London Zoo opened in 1827 and is run by the Zoological Society of London, a charity devoted to the worldwide conservation of animals and their habitats. Animals live in enclosures that create a natural environment while allowing us to see them up close. The zoo is located in Regent's Park and is open from 10 a.m. every day except Christmas Day. 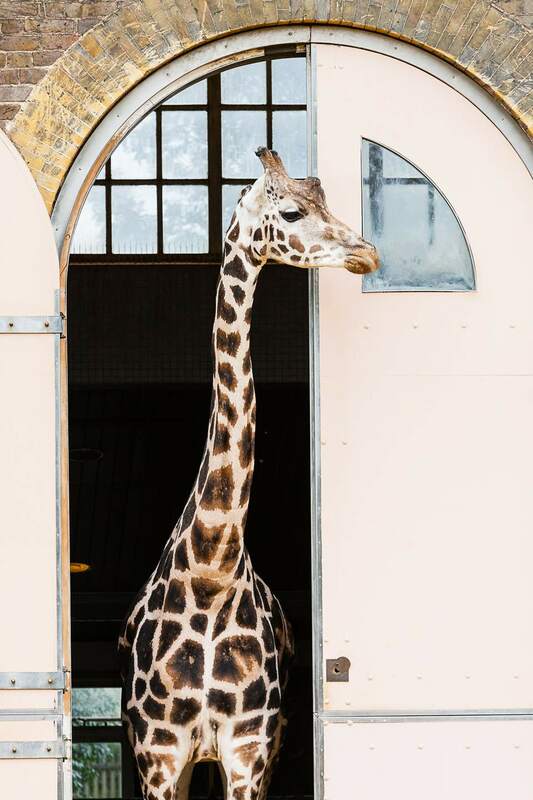 The giraffes -- everyone's favorites -- are housed in the Into Africa section, along with Red River Hogs, African Hunting Dogs, Warthogs, Zebras, and Okapis. There is a raised viewing platform near the giraffes so you can see them at their height. Giraffes have the same number of neck bones that humans do; look at yourself in the wavy mirrors in the giraffe area to see what you'd look like with a long neck. Okapis were discovered by the Zoological Society London in 1901 but were obviously well-known to the Congolese forest people before then. Okapis are very shy so be quiet if you go inside to see them. Chapman's zebras have some of the most intricate patterned coats in the world; no two are alike. Their stripes may serve to confuse predators such as lions in the wild. Tiger Territory re-creates an Indonesian habitat where visitors can come face-to-face with the animals through floor-to-ceiling glass windows. The exhibit is designed to suit the big cats' needs with features like tall trees for the cats to climb and high feeding poles. The​ Penguin Beach exhibit recreates a South American beach for a colony of Humboldt penguins. It features a large pool with underwater viewing areas, so visitors can watch the birds diving for food. There's also a penguin nursery and a pool where young penguins learn to swim. Gorilla Kingdom is a rainforest environment with no bars, where you can get close to a group of Western lowland gorillas. Visitors walk along a forest path that opens onto a clearing where the gorillas engage in natural behaviors in their social group. There are no bars to separate animals from visitors, just a moat and sections of a glass wall. See inside the Reptile House where the first Harry Potter movie was filmed. A scene from the movie, "Harry Potter and the Philosopher's Stone" was filmed in the Reptile House at London Zoo in 2001. The Reptile House is home to the zoo's fascinating collection of reptiles and amphibians, including snakes, lizards, frogs, and crocodiles. Bactrian camels are well-adapted to desert life. Their long eyelashes and their nostrils, which they can close, protect them from the sand. When food is plentiful, they build up fat reserves in their humps. There may be as few as 300-500 wild camels left. Butterfly Paradise is a giant caterpillar-shaped tunnel where you can walk with free-flying butterflies, although visitors are not allowed to try to touch them or chase them. Staff is available to help you identify the different species and to explain more about how they live. The Snowden Aviary was named after its designer, Lord Snowdon, the husband of Princess Margaret, the Queen's sister. The aviary looks almost weightless with its aluminum frame and a giant net stretched across cables. The structure is supported by tension and looks almost weightless. It is home to majestic birds like the white ibis and peacocks. A Canadian black bear cub was bought by a young veterinarian from Winnipeg, Canada, in 1914. He named the bear Winnie in honor of his hometown, and it became his regimental mascot when he traveled to Europe for World War I. This black bear was the inspiration for the world famous Winnie the Pooh by A.A. Milne. Winnie stayed at London Zoo until she died in 1934. Animal Adventure is the children's zoo, where kids can get close to the animals in a safe and fun environment. They crawl through a tunnel to pop up inside the meerkat enclosure and find it hard to resist getting wet in the Splash Zone. In the Touch Zone, kids can safely touch and feed animals such as goats and sheep. The water feature in the children's zoo at Animal Adventure lets kids play in the water and learn how important it is to conserve the environment. The area also contains the secret garden and a tipi for storytelling.